There is something about being the mother of three boys that makes you want to pour straight vodka into your breakfast cereal. I’m not saying I’ve done it, but I have been damn close. There is a dynamic to having three boys, that only a parent of three boys can understand. If you have three sons you’re probably shaking your head “yes” right now and rethinking the half-gallon of milk that you’re holding mid-pour above your cereal bowl. Wait! Don’t go there yet! My beloved father was diagnosed with terminal cancer in February of 2015. John and I began the exhausting, yet selfless job, of caring for my father during his illness. This required one of us being away from home for twelve hours at a time, then eventually, both of us being away for twelve hours, as his care required two people. How were we going to leave three teenage boys unattended? We really had no choice so we sat the boys down and laid out some ground rules about our circumstances and our expectations…”Grandpa Ed is very sick and we aren’t going to be home a lot. If we ever needed you boys to step up your game, this is the time. You’re going to have to make your own food, wash the dishes, put the trash out, wash your clothes, walk the dog and stay out of trouble.” I said. The boys nodded their heads in agreement. 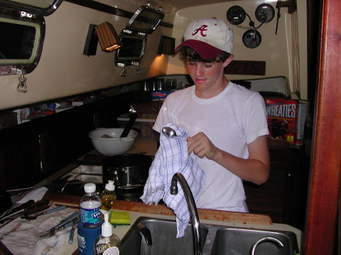 Upon returning home one evening to gather more clothes and check on the boys, we found my youngest son Marc at the kitchen sink up to his elbows in dishes and suds. He was wearing pink latex gloves with floral cuffs as he scrubbed with a vengeance. “Wow, Marc! I’m impressed!” I encouraged, as my eyes scanned the mammoth pile of glasses, dishes, pots and pans teetering on the counter. Marc smiled as I gave him a kiss and thanked him on my way out the door. I must admit, although the state of the house was far from pristine, Marc’s effort left me feeling hopeful. Maybe my boys would step up in a time of crisis. Maybe they would be able to take care of things at home after all. As soon as we stopped home, there was a knock at our back Kitchen door. John answered and our landlord (also our next door neighbor in a duplex) explained that her stove was on the fritz and asked if it would be okay if she grabbed her dinner, brought it over and used our stove. John said, “Of course” and she was gone in a flash. I was busy sorting through our bags collecting clothes that I needed to wash. Our landlord returned, setting a large pot on our stove while explaining that we were welcome to some of her “famous rice and beans.” When I looked up from our overnight bags I saw it. “What the hell is that?” I thought. I moved closer to the kitchen sink to get a better look. “John, did you put a black trash bag over the sink?” I asked. “No.” John replied, “I thought you did that.” The sink was obviously overloaded with, I would guess from the bulge, every kitchen item we owned. Atop was a very neat and precisely placed, black plastic 30 gallon trash bag. “Why in the world would I do that?” I chirped, as our landlord looked a bit shocked. “I don’t know why you would do that.” John replied, as Rocky entered the kitchen. “I did it.” Rocky boldly announced. “Why in the world would you put a trash bag over the sink?” I asked in dismay. “I was tired of looking at it.” Rocky stated and left the room. By March I was emotionally and physically drained from caring for my father. My heart ached and I had no intention of celebrating my birthday. To my surprise, John’s mother brought a birthday cake over. We were all home and the simple act of lighting the candles, singing happy birthday and eating cake together was, unbeknownst me, exactly what I needed. The mood was light and happy. I found myself relaxing, living in the moment and enjoying the conversation with my sons. “What’s that, Marc?” I smiled. “I put the frying pan in the freezer.” Marc stated. “Marc, why would you put a dirty frying pan upside down in the freezer?” I asked. “You hid THEM?” I asked. “Yup.” Marc said as he pointed to the bottom doors of our dining room hutch. John’s mother looked confused as John bent down and opened the doors. There sat a neatly stacked pile of unwashed plates, bowls, forks and spoons. All we could do was laugh. Sometimes I wonder if I taught these boys anything at all and if any one of them will have the basis skills to get by in life. Sometimes I worry that I’ve done too much for them, or maybe that I haven’t done enough. I guess as parents we tend to worry and blame ourselves. Maybe that’s part of parenting, maybe that’s normal. Sometimes I feel that nothing about my life is normal or even close to it. Sometimes in those moments, I take a minute to remind myself how our struggles, how each of our unique personalities respond to those struggles, how we somehow manage to bond together even in our differences and how our interaction and our love for each other create the laughter and the stories that make it all worth wild. Isn’t that really what life is all about anyway? Thank you, Joe! There is plenty more where that came from! Mom of two boys here! I know these moments. Paper plates save a lot of problems.! My boy (I only have one boy and one girl) is 9, but there are times I worry the same thing. I try to have him help me with some of the “simplest” of things like sorting laundry, helping with the dishes, trash etc., but I tend to get frustrated at times and take it over. My husband keeps telling me to stop otherwise his spouse will hate me when he gets older because he won’t know *how* to help around the house! 😉 It’s a work in progress!